Here's another nice Gifford image of an apple packing house, circa 1910. Looks like a strawberry patch in the foreground. That's odd. Why were there two photos for January 6? Not that I am complaining. The more the merrier. Is the boy coming in from the field carrying a hallock, or was a hallock the small baskets that went inside? The boy is holding a carrier. It's been more than 50 years since I've picked strawberries. Flats were made of wood, single layered for ease of stacking. A flat holds 2 carriers or 12 hallocks. 1 carrier in each hand and 1 in front and 1 in back. Change back from your dollar! thanks Ralph for bring back the memory of picking strawberrys......great lesion that I still remember....stoop labor was not a vocation I desired to pursue. I knew this would happen some day. I usually prepare a bunch of posts at one time and schedule them for future display. I prepared 11 new posts yesterday but forgot to change the date on this one. This was more of a "draft" for a post. I usually rework them when I decide to schedule them for publication. At any one time there are 70-80 draft posts waiting to be finalized and scheduled for publication. Here's a little background. 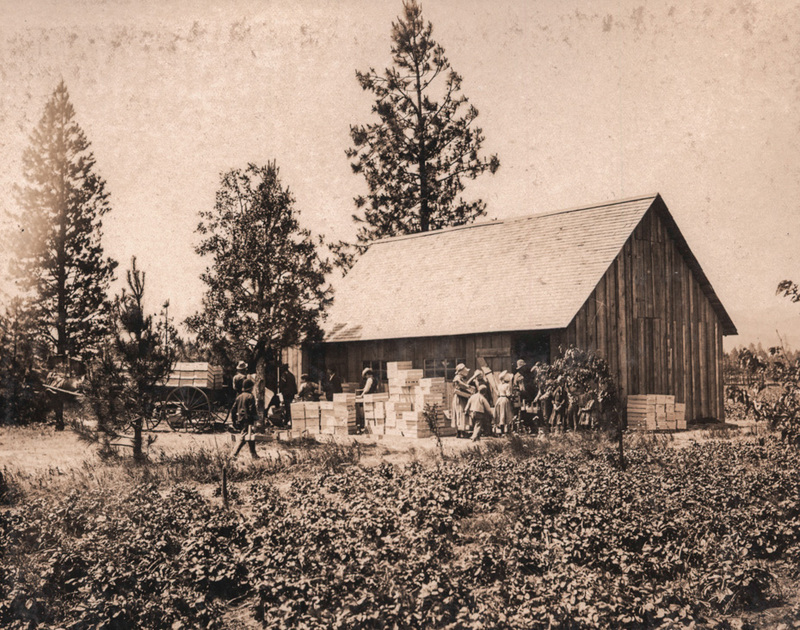 About 1910 the Hood River Commercial Club hired Benjamin Gifford to help promote orchard land in the HR Valley. We have 3 albums of 8x10 prints covering every aspect of orchards. I'm thinking of posting a series of them next week or the week after. I think Nels is correct identifying this as a strawberry operation, not apples. Most of the Gifford photos are apple orchards, but a handful are strawberry. As I recall .... strawberries were planted while the fruit trees matured .... I spy a few young trees ... anyone else ... ? Thanks Ralph. The reason I asked about the carrier is I have an old wooden one that my mom painted and decorated. It looks like what he is carrying. I didn't realize it was a strawberry carrier. All sorts of row crops were planted between rows of young fruit trees. I've seen records of everything from asparagus to tomatoes. Some day I'll post a close-up picture of the strawberry carrier to refresh Ralph's memory. Hopefully they are pleasant memories. I picked enough for 5 dollars one day near Dee.. Usually, seemed like, the girls got all of the best rows.